Buy, Rent or Skip Slash? I've been on the biggest book run ever in the past couple of months. This one was the one that started it off for me. I have been meaning to pick this up to read for quite some time. It's only NOW that I finally got around to it. Was it worth the wait? Yeah. 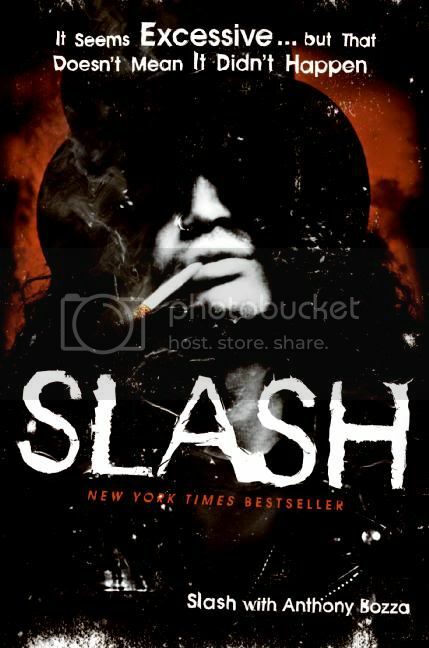 It's a pretty good read, especially for anyone that is a fan of Guns N' Roses, Slash or just the Rock and Roll lifestyle. It's all there and then some. I thought I knew everything there was to know about GN'R. There were a lot of things that I didn't even know about till I read the book. I took a lot of what I heard about the band over the years with a grain of salt because the information was coming from those that claimed to be on the inside or knew someone that was in the band, etc.... We all know how people like to make sh*t up just to get their names out there. So, it was nice to finally get all the dirt from the man himself once and for all. As good a read as it is, and it is a great read as I couldn't put it down at all, it's not a perfect book. My only complaint about the book itself is in the structure of how it was written and put together. It's not a linear telling of the pivotal moments in the creation of one of the biggest rock bands of all time. There are times that Slash (or is it the doings of his co-writer?) would go off on tangents out of nowhere, not related to what he was talking about a moment ago. And other times he mentions a particular incident but that he will get back to that later in full detail, only to never touch upon it again. The other thing I wanted to hear more about was Slash's relationship with Michael Jackson and the songs that they did together. This is only mentioned twice in the book and was extremely short at that. Oh well. Other than that I would definitely recommend this book to anyone that is a fan and even a non-fan. There are some lasting images that will stick with me forever after reading his book. Some funny (Slash dressing up in drag to sneak into a bar on ladies night) and some not so funny (Slash's numerous drug encounters). One last thing. Slash mentions that they had a documentary crew filming pretty much everything during the Use Your Illusions Tour. But unfortunately it's locked away in the vault, which is where it will stay until the guys can get their sh*t together and get through all this legal bullsh*t. I'm salivating at the idea of seeing this footage of behind the scenes stuff. But I just don't ever see this happening. Before I read the book I have always said that we will see a reunion of the original GN'R...some day. And now, after having read the book? Um...I'm going to say it's more like 5% chance of that ever happening. Ugh. But then again, if Van Halen and The Police can get back together, anything is possible. Charlie Sheen needs better joke writers. Weak. Slash ftw.